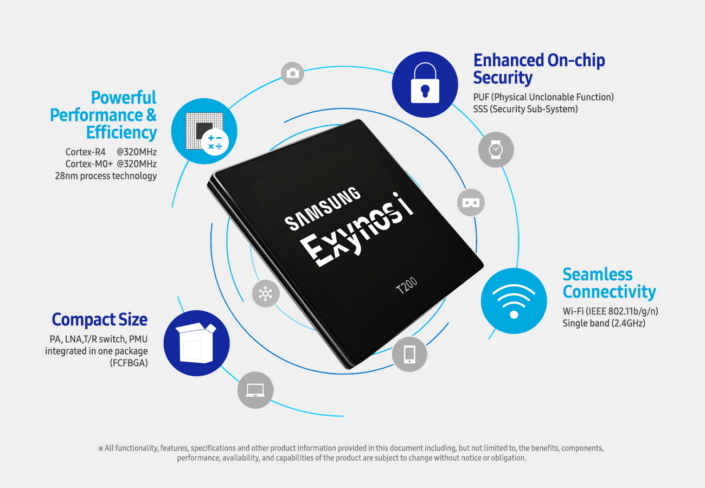 Samsung Electronics, a world leader in advanced semiconductor technology, today announced the start of mass production of its first Exynos-branded Internet of Things (IoT) solution, the Exynos i T200. Built on a low-power 28-nanometer (nm) High-K Metal Gate (HKMG) process and featuring high processing capabilities along with Wi-Fi connectivity, the Exynos i T200 is an optimum IoT solution to deliver the performance needed for upcoming IoT use cases. In terms of processing, the Exynos i T200 utilizes both a Cortex®-R4 processor and an additional Cortex®-M0+ processor enabling the devices it supports to process and perform various tasks without the need for an extra microcontroller IC in the system. For connectivity, the Exynos i T200 supports 802.11b/g/n single-band (2.4GHz), and has received the Wi-Fi CERTIFIED™ certification from the Wi-Fi Alliance, and Microsoft Azure Certified for IoT. It also natively supports IoTivity, an IoT protocol standard from the Open Connectivity Foundation (OCF), which enables seamless interoperability between IoT devices. To address security and privacy, one of the biggest current challenges for device manufactures and consumers in applying IoT capabilities, the Exynos i T200 utilizes a separate and designated security management hardware block called the Security Sub-System (SSS). In addition, the Physical Unclonable Function (PUF) IP provides secure data storage and device authentication management without the need to fuse a key onto silicon, and rely on a discrete security IC for key storage. This security measure provides a much higher level of security compared to the conventional one-time programmable (OTP) based solutions.